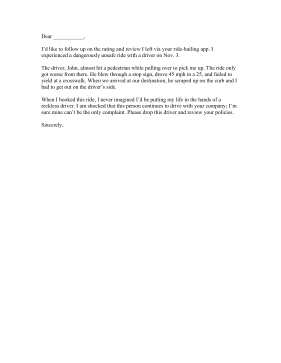 Perfect for complaining to Uber, Lyft, or a taxi company, this sample letter cites a reckless driver and dangerous ride. I'd like to follow up on the rating and review I left via your ride-hailing app. I experienced a dangerously unsafe ride with a driver on Nov. 3. The driver, John, almost hit a pedestrian while pulling over to pick me up. The ride only got worse from there. He blew through a stop sign, drove 45 mph in a 25, and failed to yield at a crosswalk. When we arrived at our destination, he scraped up on the curb and I had to get out on the driver's side. When I booked this ride, I never imagined I'd be putting my life in the hands of a reckless driver. I am shocked that this person continues to drive with your company; I'm sure mine can't be the only complaint. Please drop this driver and review your policies.